bleach, it will damage the dye in fabrics but more importantly it will kill a wide variety of pathogens. This makes bleach a very important substance for modern settled life. For any settled life the abilbity to create bleach could be a life saving skill. Surprisingly beach is quite easy to make, the process does release some hazardous gasses such as Hydrogen gas and Chlorine gas, but if done in a well vested area this should not be a problem. Chlorine gas if exposed to an alkaline solution will produce hypochlorites. 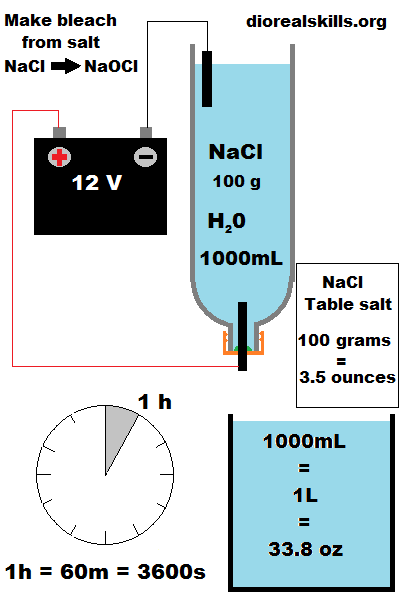 For this reaction, where the chlorine is formed is important as we want it to have a long path to the surface to react with the water, so the chlorine producing electrode should be close to the bottom of the electrolysis container. The hydrogen gas we don’t care about to much, so the negative electrode is close to the surface. carbon graphite from a battery, larger in diameter is better. wash to remove chemicals and plastics that may be on the surface, heating is an aceptable way to remove plastics. Add to bottle cap by puncture. seal with candle wax. the salt used should be NaCl, without added iodide which is common in some manufactured salt used for consumption. some salt has anti caking agents, these should not cause a problem. possible sources, car battery, solar panel, 8 x 1.5V batteries in series. bubbles will form from both electrodes, a smell of chlorine will be detectable. the water will become yellowish. Use pool testing strips to test for chlorine levels. 2 to 3+ table spoons in 5 litres of water. after about 20 minutes add another half a tablespoon of bleach to water. 1 part bleach to 100 parts water (up to 130 parts water) by volume. Some slight smell of chlorine should be present in the water, a little stronger than domestic tap water smell. note the website link talks about charcoal , but actually means graphite.